The narcissist is compulsive and prone to ritualistic behaviour. His False Self demands devotion and tenacity. The re-enactment of past traumas sustains the narcissist’s grandiosity and reinforce reward-penalty cycles and his self-image as a “bad object”. Are there compulsive acts unique to the narcissist? In general, there is a strong compulsive strand in the narcissist's behaviour. He is driven to exorcise internal demons by means of ritualistic acts. The narcissist's very pursuit of Narcissistic Supply is compulsive and he is besieged by related intrusive and unwelcome, ego-dystonic, and, at times, persecutory (paranoid) thoughts (“I ought to, deserve, and am perfectly entitled to be famous/rich/powerful/brilliant”, “I must get noticed at any cost and by whatever means necessary, or something horrible will happen to me”, “I am being constantly unjustly mistreated, hated, discriminated against, ignored, mocked, and underestimated”). But, on a deeper, psychodynamic level, the narcissist seeks to recreate and re-enact old traumas, ancient, unresolved conflicts with figures of (primary) importance in his life. The narcissist feels that he is "bad" and diffusely guilty and that, therefore, he should be punished. So, he makes sure that he is disciplined. These cycles possess the tint and hue of compulsion. In many respects, narcissism can be defined as an all-pervasive obsessive-compulsive disorder. The narcissist is faced with difficult conditions in his childhood: either neglect, abandonment, capriciousness, arbitrariness, strictness, sadistic behaviour, abuse (physical, psychological, or verbal) - or doting, "annexation" and "appropriation" by a narcissistic and frustrated parent. The narcissist develops a unique defence mechanism: a story, a narrative, another self. This False Self is possessed of all the qualities that can insulate the child from an ominous and hostile world. It is perfect, omnipotent, omniscient, and omnipresent. In short: it is divine. The narcissist develops a private religion with the False Self at its centre. It is replete with rites, mantras, scriptures, and spiritual and physical exercises. The child worships this new deity. He succumbs to what he perceives to be its wishes and its needs. He makes sacrifices of Narcissistic Supply to it. He is awed by it because it possesses many of the traits of the hallowed tormentors, the parents. The child reduces his True Self, minimises it. He is looking to appease the new Divinity – not to incur its wrath. He does so by adhering to strict schedules, ceremonies, by reciting texts, by self-imposition of self-discipline. Hitherto, the child is transformed into the servant of his False Self. Daily, he caters to its needs and offers to it Narcissistic Supply. And he is rewarded for his efforts: he feels elated when in compliance with the creed, he emulates the characteristics of this entity. Suffused with Narcissistic Supply, his False Self content, the child feels omnipotent, untouchable, invulnerable, immune to threats and insults and omniscient. On the other hand, when Narcissistic Supply is lacking – the child feels guilty, miserable, and unworthy. The Superego then takes over: sadistic, ominous, cruel, suicidal – it chastises the child for having failed, for having sinned, for being guilty. It demands a self-inflicted penalty to cleanse, to atone, to let go. Caught between these two deities – the False Self and the Superego - the child is compulsively forced to seek Narcissistic Supply. Success in this pursuit holds both promises: an emotional reward and protection from the murderous Superego. Throughout, the child maintains the rhythms of regenerating his conflicts and traumas in order to try and resolve them. Such resolution can be either in the form of punishment or in the form of healing. But since healing means letting go of his system of beliefs and deities – the child is more likely to choose punishment. The narcissist strives to reenact old traumas and open old wounds. For instance, he behaves in ways that make people abandon him. Or he becomes rebellious in order to be chastised by figures of authority. Or he engages in criminal or antisocial activities. These types of self-defeating and self-destructive behaviours are in permanent interaction with the False Self. The False Self breeds compulsive acts. The narcissist seeks for his Narcissistic Supply compulsively. He wants to be punished compulsively. He generates resentment or hatred, switches sexual partners, becomes eccentric, writes articles and makes scientific discoveries – all compulsively. There is no joy in his life or in his actions. Just relieved anxiety, the moment of liberation and soothing protection that he enjoys following a compulsive act. As pressure builds inside the narcissist, threatening the precarious balance of his personality, something inside warns him that danger is imminent. He reacts by developing an acute anxiety, which can be alleviated only with a compulsive act. If this act fails to materialise, the emotional outcome can be anything from absolute terror to deep-set depression. The narcissist knows that his very life is at stake, that in his Superego lurks a mortal enemy. He knows that only his False Self stands between him and his Superego (the True Self is warped, depleted, immature and dilapidated). 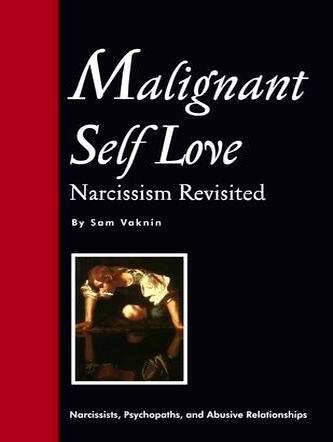 The Narcissistic Personality Disorder is an obsessive-compulsive disorder writ large. With the narcissist, the compulsive acts constitute a part of a larger "grandiose" picture. If a narcissist shops – it is in order to build up a unique collection. If he gambles – it is to prove right a method that he has developed or to demonstrate his amazing mental or psychic powers. If he climbs mountains or races cars – it is to establish new records and if he binges – it is part of constructing a universal diet or bodybuilding and so on. The narcissist never does simple, straightforward things – these are too mundane, not sufficiently grandiose. He invents a contextual narrative in order to lend outstanding proportions, perspectives, and purpose to his most common acts, including the compulsive ones. Where the regular compulsive patient feels that the compulsive act restores his control over himself and over his life – the narcissist feels that the compulsive act restores his control over his environment and secures his future Narcissistic Supply. With the narcissist, the compulsive acts enhance the reward–penalty cycle. At their inception and for as long as they are committed – they reward the narcissist emotionally in the ways described above. But they also provide him with fresh ammunition against himself. His Sins of indulgence lead the narcissist down the path of yet another self-inflicted punishment. Finally, "normal" compulsions are usually effectively treatable. The (behaviourist or cognitive-behavioural) therapist reconditions the patient and helps him get rid of his constricting rituals. This works only partly with the narcissist. His compulsive acts are merely an element in his complicated personality. They are the sick tips of very abnormal icebergs. Shaving them off does nothing to ameliorate the narcissist's titanic inner struggle.